A meeting in the matter of Allowances related to the Railways was held today under the Chairmanship of Secretary (Finance), Government of India and others. Staff Side was headed by the undersigned and Com. M. Raghavaiah, General Secretary NFIR. The discussion was initiated by me. At the outset, I reminded the Committee, specifically the Finance Secretary, that strike situation was averted by the government by deputing three Cabinet Ministers, viz. Hon’ble Home Minister, Hon’ble Finance Minister and Hon’ble Railway Minister. On 29th June, 2016, the government issued notification and this was firmed-up by another notification on 06.07.2016 issued by the Ministry of Finance(Deptt. of Exp.). The government took four months time to decide the issues of Minimum Wage, Pay Fixation Formula, Allowances and National Pension System(NPS) etc. I pointed out that, “four months time is running out, so the reports of these committees should be published and all the allowances should be revised and sanctioned w.e.f. 01.01.2016. The matter of Breakdown Allowance, Coal Pilot Allowance, Commercial Allowance (Flag Station Allowance), i.e. 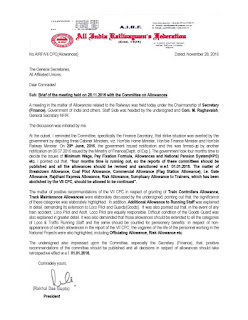 Gate Allowance, Rajdhani Express Allowance, Risk Allowance, Sumptuary Allowance to Trainers, which has been abolished by the VII CPC, should be allowed to be continued”. The matter of positive recommendations of the VII CPC in respect of granting of Train Controllers Allowance, Track Maintenance Allowances were elaborately discussed by the undersigned, pointing out that, the significance of these categories was elaborately highlighted. In addition, Additional Allowance to Running Staff was explained in detail, demanding its extension to Loco Pilot and Guards(Goods). It was also pointed out that, in the event of any train accident, Loco Pilot and Asstt. Loco Pilot are equally responsible. Difficult condition of the Goods Guard was also explained in greater detail. It was also demanded that those allowances should be extended to all the categories of Loco & Traffic Running Staff and the same should be counted for pensionery benefits. In respect of non-appearance of certain allowances in the report of the VII CPC, the vagaries of the life of the personnel working in the National Projects were also highlighted, including Officiating Allowance, Risk Allowance etc. 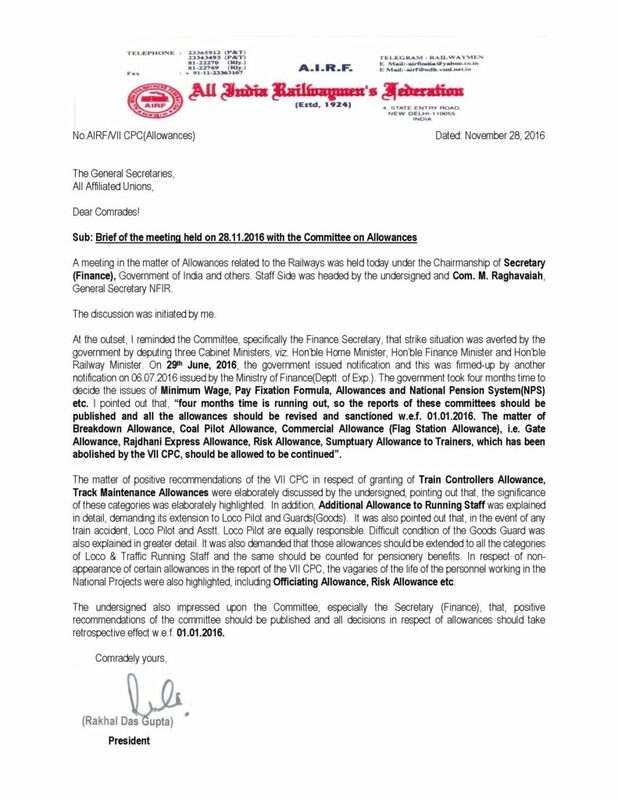 The undersigned also impressed upon the Committee, especially the Secretary (Finance), that, positive recommendations of the committee should be published and all decisions in respect of allowances should take retrospective effect w.e.f. 01.01.2016. The matter of positive recommendations of the VII CPC in respect of granting of Train Controllers Allowance, Track Maintenance Allowances were elaborately discussed by the undersigned, pointing out that, the significance of these categories was elaborately highlighted.